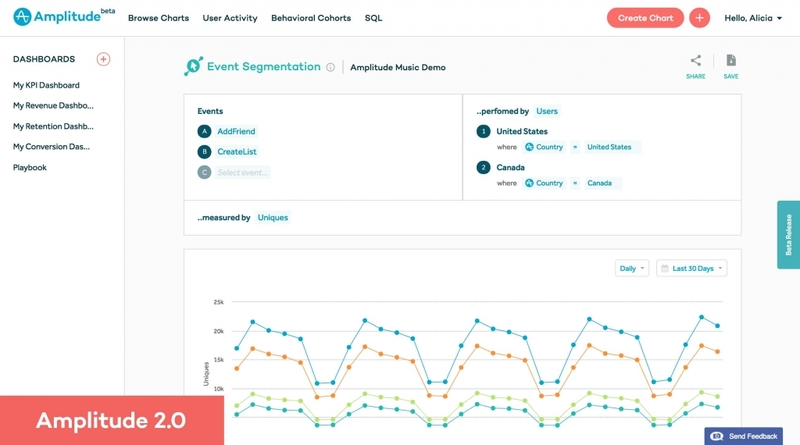 Last week, we announced Amplitude 2.0—the next generation of our product analytics platform. Today, I’m sharing the story behind 2.0: the industry shift in how companies are building products, how our users shaped the way we rebuilt Amplitude, and our vision for the future of products. Back in March of 1995, Microsoft released a product called Microsoft Bob. Designed with computer novices in mind, Bob was supposed to make it easier for the average person to use a PC. 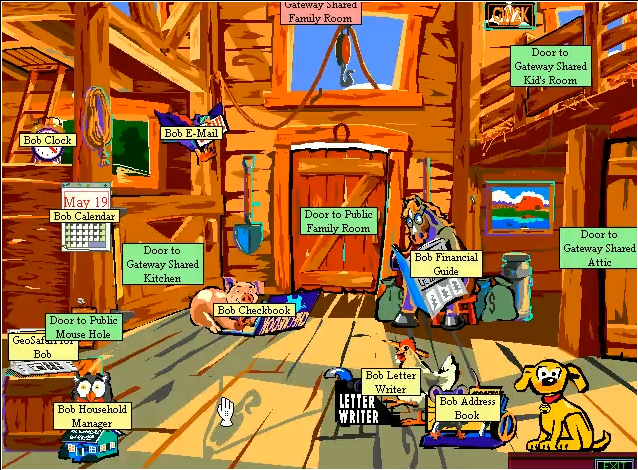 The interface was styled as a virtual home where you navigated between rooms to access different programs, all with the aid of an animated dog as your guide (whose later reincarnation showed up in Microsoft Office as our old friend, Clippy). Not really sure where the “Door to Public Mouse Hole” leads… Image source. Microsoft made a huge announcement at CES, poured money into advertising, and stocked store shelves with Bob. But no one bought. Rather than making the PC more user friendly, Bob patronized beginners with it’s overly cutesy characters and had almost prohibitive hardware requirements. Most importantly, it wasn’t how anyone actually wanted to use a computer. By early 1996, Bob was discontinued. 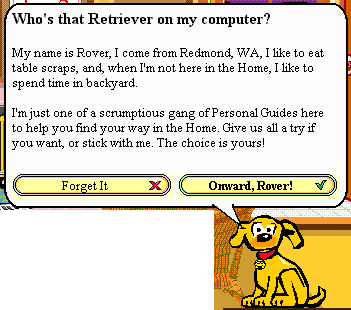 Meet Rover, the forerunner to Clippy and the rest of the “scrumptious gang” of animated assistants. Another fun fact, everyone’s favorite font, Comic Sans, was created specifically for Bob. Thanks Bob. Image source. Back when software used to come on physical disks or licenses, companies had to think the entire product through during development — because once you shipped it, you were done. With products like Bob, there was no way to course-correct based on how people were using the product, at least not until the next year’s release. For Microsoft, Bob resulted in wasted resources on product development, advertising, and distribution, as well as a highly visible failure that gained the title of “worst product of the decade”. This was an era when customers didn’t have much choice, either. In the case of Bob, some users ended up choosing Macintoshes, while many others just waited a few months until Windows 95 was released (Bob only sold 58,000 copies compared to the 2.75 million copies of Windows 95 sold in its first month after release). Options were limited, and often you (or your company) needed the solution that Microsoft, Oracle, or SAP was selling, so you were forced to adjust your behavior to fit what the product prescribed. Even if the interface was clunky, unintuitive, and all-around aggravating, you had to live with it. That’s not how we make products anymore. Rather than spending years to produce a fully-baked product, companies can launch a minimum viable product, learn from how users interact with it, and quickly adapt the product to fit users’ desired behavior. The most sophisticated companies have embraced this user-driven product development. Facebook overtook MySpace after discovering that adding friends was the critical action to retain users long term. Netflix is using viewing data to create original shows like House of Cards and now rivals traditional TV. Despite having to play catch-up to MySpace, Facebook rapidly overtook them based on user insights like ‘7 friends in 10 days’, and went on to become the world’s largest social network. Image source. Outside of Silicon Valley, established enterprises are also adopting these methods.Intuit grows revenue and outperforms the market through experimentation, running hundreds of tests on TurboTax during the 100-day tax season. Southwest Airlines uses customer behavior data, like which city pairs people are searching for, to improve their services and optimize routes. These companies are turning to user behavior data as a direct line of communication with their users: a means to learn what they want, who they are, and what motivates them to stick around or leave for a competitor. In the days of packaged software, the product shaped the user’s behavior. Now, user behavior shapes the product. By learning from user behavior data, insights-driven companies use this constant feedback to build better products—and it’s giving them a competitive edge. In fact, companies with advanced analytics outstrip their competitors because they are 5x more likely to make decisions faster and execute more effectively. And companies today certainly aren’t lacking in data—in fact, we’ve generated 90% of the world’s data in the last 2 years alone. But there’s a disconnect: despite having all this data, 80% of customer data is wasted, completely unused. Why aren’t all companies taking advantage of user behavior data to build the products their users actually want? Companies struggle to make the shift to user behavior-driven product development because the people who design and create products don’t have access to the data they need. In a recent survey, over 50% of companies reported that it takes them anywhere from days to months to answer a question from user behavior data. Since direct data access is often restricted to analysts and data scientists, every time a product manager, marketer, or company exec has a question, they need to submit a request to the data team and wait in a queue for it to get prioritized. Once they get the report back, it’s not always clear how the metrics were calculated or exactly how the user segments were defined. When it’s that difficult to get answers from data, people eventually give up and stop asking questions. They end up relying on unreliable factors like intuition, assumptions, or the loudest person’s opinion, rather than data. As a result, most companies today are rich in data, but poor in insights. To fix that, the way we relate to data needs to change. We’ve already talked about the shift happening from products driving user behavior, to user behavior now driving products. However, this will never become a reality for the majority of companies unless we make a fundamental shift in how we relate to and interact with data. If you want your company to make the shift to building a product shaped by user behavior, everyone at your company, not just data scientists, needs access to behavioral data to answer questions, make better decisions, and ultimately build a product users love. Think back to how difficult it was to access information before the Internet. You had to physically go to a library, where librarians were the gatekeepers who could help you find what you were looking for. Finding a book or article required knowledge of the right subject headings to look for in the catalog, and access was limited by what your local library had on the shelves. You might have to wait several weeks for a book to be returned, and then you needed to sift through the book’s index to find the exact information you were hoping to find. Today, virtually unlimited information is available as soon as you type a few keywords into Google on your phone. Within seconds, you can find exactly what you need, whoever you are, wherever you are. Think about how much the way we access information has changed. It’s time for the way we access data to undergo the same shift. It’s time for the way we relate to data to undergo that same kind of transformation. Data shouldn’t be locked up, accessible only via gatekeepers with the knowledge to interpret it. You shouldn’t need to wait weeks to get the information you need to make a critical business decision. You shouldn’t need to be a data scientist to get meaningful insights from user data. When every person at your company can get the answers they need, when they need it, the value of data for building a better product becomes a reality. If insights are directly accessible to the people who need them, they will be encouraged to keep asking questions and get a deeper understanding of user behavior. This drives the cycle of learning, iteration, and improvement, accelerating the rate at which you can build a product your users love (and ultimately, drive revenue). Rapid iteration and constant experimentation are critical to keep pace in an industry where speed is often the defining characteristic of market leaders. In addition, better data access creates company alignment because you all have the same information. Product, marketing, and sales teams can agree on which metrics actually matter for reaching your company goals, and each team can track their own progress and dig deeper when things start getting off track. This kind of open data access also helps the data specialists at companies operate on a higher level. The data team can be the ‘data educators’ of the company, helping teams get up to speed with analytics tools so that they can answer their day-to-day questions – as the proverb goes, teaching them to fish rather than giving them a fish every time they’re hungry. As other teams become self-sufficient, data teams can spend their time tackling exploratory, complex problems to push your product forward instead of fulfilling an endless stream of requests. 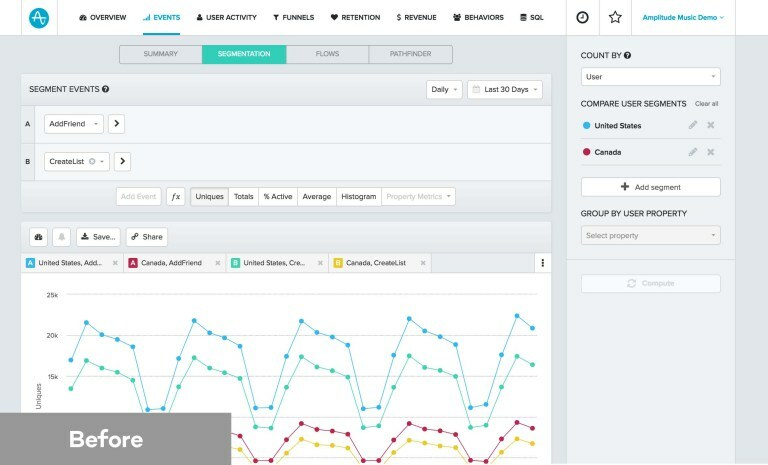 Companies like Tableau and Looker have made some great first steps in this direction, making business data more accessible and visually understandable to business end-users. However, these solutions still rely on analysts to wrangle the data and create the initial reports, which business users then might be able to dig into just one level deeper. It’s still difficult for a non-expert to answer ad-hoc questions not contained within a pre-made report. In addition, these solutions aren’t built for answering questions about user behavior. What sets apart your most valuable users from the rest of the pack? How do users navigate through your product? Which features are hooking users and driving them to retain long-term? These are the types of questions that product managers and marketers need answers to every day. Last year, we announced the Behavioral Layer — analysis features that make it possible for product managers to answer complex behavioral questions, like which user actions lead to retention, in just a few clicks. These types of analyses were previously only done at companies with advanced in-house growth teams (like Facebook and Uber) because of how difficult and time-consuming they were. We wanted to make it easier for other companies to actually ask those questions. However, while some of our users love these features, we discovered (by looking at our user behavior data!) that many of those without an analytics background weren’t taking full advantage of the behavioral analyses. So we went back to the drawing board. We talked to people at companies who are trying to make this shift in how they relate to data, and ultimately their users. They want to expand the roles that can meaningfully interface with user data beyond the traditional roles of data analysts and engineers. By learning from our own users’ behavior: how different roles use analytics in their day-to-day work, how they explore data to answer ad-hoc questions, and how they make decisions, we’ve rebuilt Amplitude from the ground up. With the release of Amplitude 2.0, we’re taking the next step in helping businesses understand their users so that they’re equipped to build the best product experiences possible. It’s now easier than ever for anyone, regardless of experience with analytics, to access, explore, and learn from their user behavior data. Before: As we added additional features and gave our customers more flexibility, our chart controls started to get out of hand. It got to the point where new Amplitude users would get into the product and have no idea what they were looking at or what controls were available to them. Controls were also organized differently for different charts like Event Segmentation, Funnels, and Retention, making things even more confusing. Event segmentation chart in Amplitude legacy. Look at all those buttons! I count at least 14. Amplitude 2.0: In 2.0, we redesigned chart controls and standardized them across most chart types. Each chart now has 3 panels of controls that follow a logical progression: first you select which events to analyze, then you select the cohorts or segments of users, and finally you decide which metrics to visualize. The exact same event segmentation chart in Amplitude 2.0. Before: We have a few features dedicated to sharing data, including email reports, alerts, and shareable links. However, a lot of our users told us that they were copy-and-pasting screenshots of Amplitude charts into everyone’s favorite communication tool: Slack. 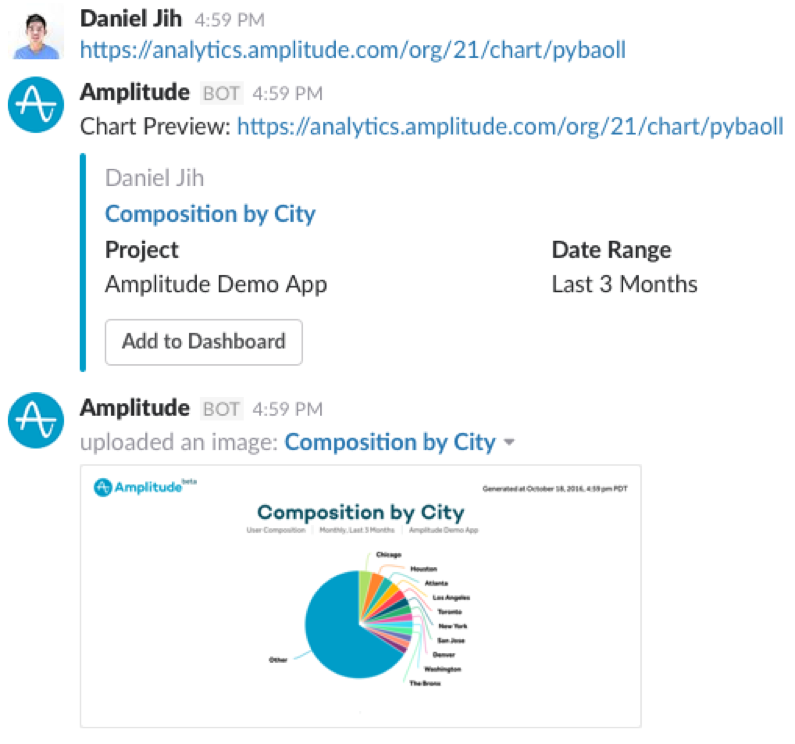 Amplitude 2.0: As a result, we’ve built a Slack integration that displays a chart preview and additional details any time you paste an Amplitude link into Slack. We also have buttons that allow you to add a chart to one of your own dashboards without leaving Slack. There are many more improvements in 2.0, including some brand new features that didn’t exist before. I won’t get into all of them here, but you can request a demo to get your own sneak peek before it’s released to everyone. As of last week, all of our Enterprise customers now have access to Amplitude 2.0, and our team is hard at work on the finishing touches before the public release to all our users. Dozens of customers, including MINDBODY, LogMeIn, and Postmates, have been using Amplitude 2.0 during a closed beta period over the past few months and have provided us with invaluable feedback and guidance throughout the process. Amplitude 2.0 wouldn’t exist without them. 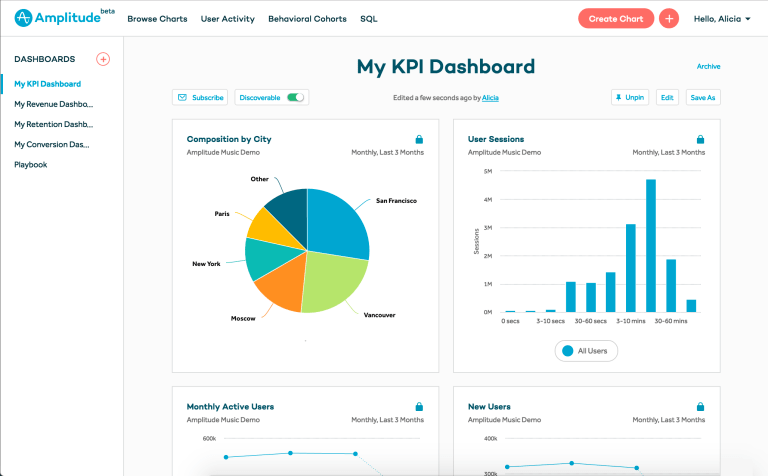 We’re already seeing the impact Amplitude 2.0 has on enabling product managers, marketers, customer support reps, and execs to explore and learn from their user behavior in real-time, instead of needing to rely on analysts to run reports. “Amplitude 2.0 empowers non-analysts to more quickly make data-based decisions regarding product development,” says Chet Brandenburg, Chief Product Officer of MINDBODY. As more companies, including ourselves at Amplitude, truly start listening to what their users tell them through their actions, we’ll see better products that meet the needs and match the behavior of the people who use them. We can even imagine a future where products will personalize experiences, responding in real-time to tailor the product to each person’s behavioral patterns and needs. While we aren’t there yet, in the meantime we need to equip the people who design and create products with the means to understand their users’ behavior and make decisions with the best information possible. That’s why Amplitude exists: to help companies build better products. Thanks for reading! Amplitude 2.0 has been a huge undertaking by essentially every team at the company, and we’re incredibly excited to finally share it with you. Look out for more in the coming months. We spend more time at the office than we do in our own homes, so ensuring it is a place anyone can thrive and find success is a priority.